Thanks to a long history of redlining, formerly black neighborhoods in cities around the country are continuously disappearing under the rapacious churn of financial real estate interests. But city blocks in prime locations aren’t the only things being lost. Gentrification is also happening in our classrooms and books, pushing out the past, erasing the lives and struggles of African Americans from our collective memory. Take A Birthday Cake for George Washington, for example, a children’s book by Ramin Ganeshram published by Scholastic. In it, smiling, happy slaves wrap their arms around their master, the first U.S. president. In a Texas high school geography textbook published by McGraw-Hill, enslaved Africans are described as “workers,” rather than slaves, and placed in a section titled “Patterns of Immigration”—as if they came here looking for a better life. In Jefferson County, Colorado, the School Board adopted a proposal to avoid the use of materials in its advanced placement high school history curriculum that “encourage or condone civil disorder, social strife or disregard for the law”—banning, of course, any discussion of the lunch counter sit-ins, freedom rides, and other actions causing “social strife” and which are foundational for the Civil Rights Movement. One section on the website is “Teaching with Current Events,” and includes a lesson, “Stand Your Ground and Castle Doctrine Laws…” Here’s the lesson’s first discussion question: “Florida’s ‘Stand-Your-Ground’ law states ‘A person who is not engaged in an unlawful activity and who is attacked in any other place where he or she has a right to be has no duty to retreat and has the right to stand his or her ground and meet force with force, including deadly force. While black history has long been redlined and ghettoized, the corporate wrecking ball is swinging with a renewed velocity, aiming at cornerstones of black history as part of a broader resurgence of racism in the United States. This gentrification of the contributions of black people to our society is sanitizing white supremacy. In 1999, the establishment’s absorption of the image of Malcolm X was marked by the U.S. Postal Service issuing a Malcolm X stamp honoring his contributions to human rights. Never mind that the FBI surveilled and harassed him and were complicit in his assassination. Meanwhile, civil rights leaders like Ella Baker and Fannie Lou Hamer are left out of history completely—no stamps for them. This paving over of black history, and failure to tell the true stories of black heroines and heroes paves the way for developers who destroy black neighborhoods and push out black people out of their homes. The historic process of neighborhood gentrification began in the 1960s and has accelerated in the new millennium, as the gap between white and black wealth has become the greatest since 1989. Today, millions of African Americans are being displaced by so-called “free market forces” and are forced to relocate to suburbs without adequate services or job opportunities. This transition in Washington, D.C., once known as the “Chocolate City,” is marked by the condominiums built on its historic U Street (one featuring a tanning salon on the ground level). In Seattle, there is a construction crane on every corner, while the rate of black homeownership has dropped by nearly half since 2000. The occupation of black neighborhoods around the country by police ready to use deadly force helps fuel the displacement and reassures the returning white gentry that they will be kept safe. However, the engineers of the movement for Black lives are constructing one of the most powerful resistance movements in more than a generation, which is giving confidence to communities across the country to stand up and fight back. In response to black community pressure, Scholastic pulled the children’s book from retail shelves and issued an apology. In the case of the Texas textbook, Roni Dean-Burren and her freshman son launched a successful Facebook and Twitter campaign forcing McGraw-Hill to acknowledge that Africans’ enslavement was not the same as white wage-labor, and to alter their online textbook. In response to the Jefferson County School Board proposal to effectively erase the Civil Rights Movement from history, hundreds of high school students from 17 schools staged a mass walkout. And in 2015, three conservative school board members were ousted in a recall. And while the Koch brothers fund the creation of materials glossing over injustice and trauma inflicted on the black community by the killing of people like Trayvon Martin, social justice educators are occupying the curriculum with powerful lessons that connect his death to long legacy of state sanctioned murder. Black Lives Matter activists have been demonstrating across the country, demanding an end to police brutality and murder. As we hit the streets, though, we also must hit the books. The struggle to de-gentrify textbooks is inextricably linked to black people reclaiming their past, present and future. Online, in neighborhoods, in classrooms, and in the streets, organized resistors are building a new black history on a foundation of equity and justice. 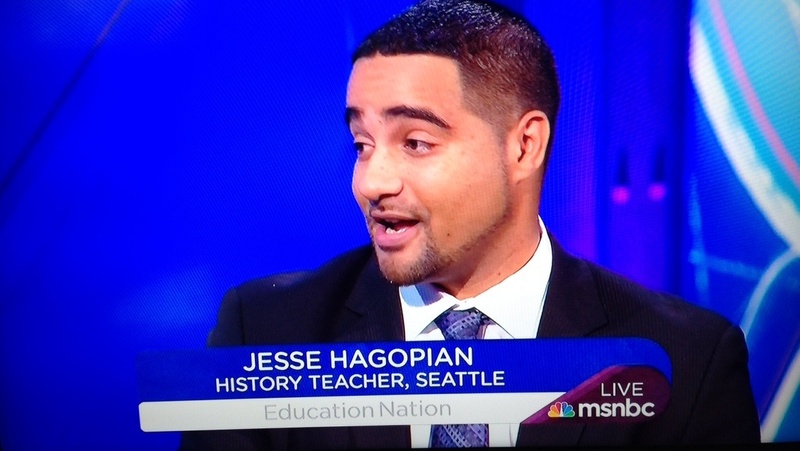 Jesse Hagopian teaches history and is the adviser to the Black Student Union at Garfield High School in Seattle, the site of the historic boycott of the MAP test in 2013. He is an associate editor for the acclaimed Rethinking Schools magazine and the editor of, and contributing author to the 2014 book, More Than a Score: The New Uprising Against High-Stakes Testing. He is also the son of Gerald Lenoir. Follow Jesse on his blog, IAmAnEducator.com, on Facebook or Twitter.